Organizations have always known that success depends on people communicating effectively, contributing not only to the bottom line but to a positive performance environment. Successful organizations also know that good communication is not just about speaking well. It’s about the quality of the connection between the senders and the receivers of the message. The strongest influence on the quality and outcome of all communications is the ability to listen effectively. Only by listening effectively can you respond appropriately. Listening is more than hearing. Listening is the ability to receive, attend to, interpret, and respond to verbal messages and other cues, like body language, in ways that are appropriate to the purpose. For example, if the message is a plea for help, our purpose is to be helpful, so we listen and respond with concern. If the message is entertaining, our purpose is to enjoy, so we listen and respond in a relaxed manner. If the message is intended to persuade us, our purpose is judgment, so we listen and respond critically. But it is estimated that people screen out or misunderstand the intended meaning or purpose of what they hear in over 70 percent of communications! This is the biggest contributing factor to miscommunication. Appreciative: Listens in a relaxed manner and seeks enjoyment, entertainment, or inspiration. Evaluative: Listens in order to make a decision based on information provided and may accept or reject message based on personal beliefs. Purpose or the primary focus and intent of the communication. Motivation or the listening strategies to best accomplish the purpose of the communication. Behavioral Indicators or the appropriate verbal and nonverbal signals that can be observed by the sender and impact the quality of the communication. 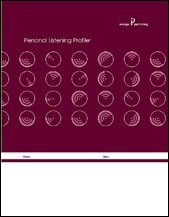 The Personal Listening Profile Facilitator’s Kit provides everything trainers need to administer the Personal Listening Profile in facilitated sessions. The kit includes research and technical background, a fully scripted seminar, presentation materials on CD-ROM, and two profiles. Please contact us via the contact form for more information, price list, shipping, taxes, terms, or to place an order. “DiSC”, “Everything DiSC”, and “Personal Listening Profile” are registered trademarks of John Wiley & Sons, Inc.